Eight boys were in action today to compete for four seats in semi-finals. Yesterday a war of words started between Mark Allen and Stuart Bingham ( For Reference: Day 4 - War of Words set between Allen & Bingham Before QF ). Today they tried to solve their rival by their quarter-final match today. 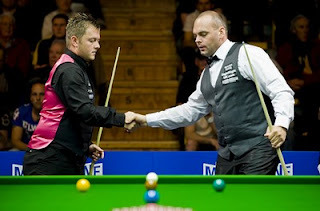 Stuart Bingham proved to Allen he was wrong, by winning the match 5-3. Bingham created his best ranking results today by first moved to the semi-finals. Bingham was motivated by Allen's words and had runs of 118, 112, 96 and 66 from 2-1 down. Bingham: "It didn't upset me, it just gave me more drive,"
"Mark is a great snooker player and you don't get to be in the top 16 for five years for nothing. Snooker player wise he is up there with the best, but off the table it's another thing. "It fired me up 1,000 per cent and maybe that hindered me a bit. Once I calmed down I got into the scoring mode and you can see the result. "At the end he said 'well played' and said 'shot' when I made good shots but he didn't get it back. I just got on with my job. "I know I'm playing well enough to do some damage and I'm fighting away and in the semis. "I thought I would be punching the air but I tried to let the snooker do the talking and I can't wait until tomorrow. Allen: "Stuart deserved to win, he played better and scored heavily," said Allen. "I lost it in the first four frames and could've been 3-1 up but Stuart could've made four centuries and that's hard to live with. "It didn't surprise me because I know what he's capable of. I never said he's not a good player, I just know he's not good under pressure. "One quarter-final win is probably a good return for someone of his bottle but today he didn't have to rely on his bottle as he just outplayed me. "It was not as if I made any lies. I said what other people think but they're too scared to say it. "I speak my mind and I know it gets me in trouble with the rest of the players but we're not all friends, we're competitors. "I've not really lifted my cue to practice so I've probably done better than I deserved. "It was good to get some money in Bangkok, that takes the pressure off. With ranking points here winning a couple of matches doesn't do me any harm. "I enjoyed this game more and hopefully that's me getting the bug back for practicing more. When I do I know I won't be losing again to people like Stuart." Okay this rival will never be solved. I believe Mark will become more mature and mind his words in the future. Just let the snooker do the talking! 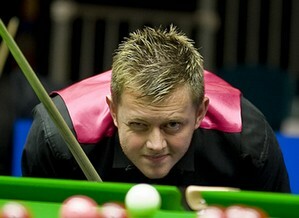 Bingham now plays Shaun Murphy in his next match. 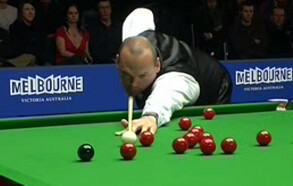 Murphy ended Matthew Selt's magnificent run on Australian Goldfields Open today. Murphy stormed into semi-finals by a 5-3 win despite Selt hit a 137, the highest break of the tournament so far before Williams knocked 142 later today. Selt was happy with his run: "It's been a great tournament for me and I can take a lot of positives but it would've been nice to carry on. Beating John was massive for me and this week's been good experience." The current World Number 1 Mark Williams knocked highest break of the tournament so far on his way to semi-finals. He rewrote the highest break twice in the match, 118 and 140 to level 2-2 before 142 in the decider. 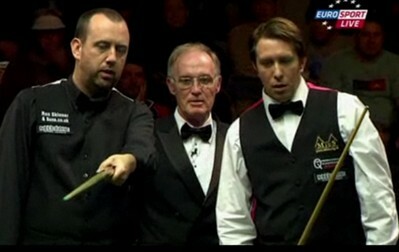 Williams edged Dominic Dale by 5-4. Williams was satisfied with his form: "I potted well tonight. The last two matches have been a massive improvement from the first one which was awful. By the time I get used to the jet lag it will be time to fly home.'' "I'm just excited to be in the semi-finals. I haven't played out here for 20 years and it's been excellent to be back, hopefully I can go all the way." 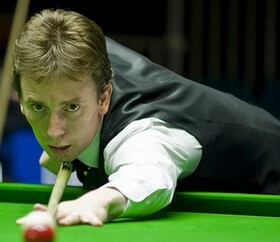 Williams will not have an easy one in the semi-finals because he is Ken Doherty. It's Ken's first semi-finals since 2006 China Open. They will perform a repeat match of the final on 2003 World Championship - of course Ken won't want the same results. 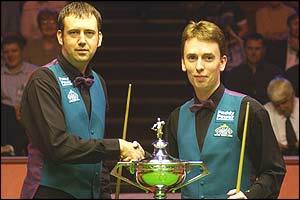 Repeat Final of World Championship 2003 - Who will win this time? 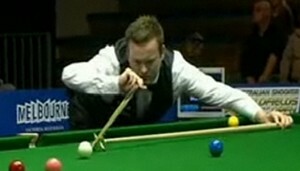 Doherty went 4-1 up with good breaks before Selby dragged to 3-4. The Jester led 58-1 in the eighth frame with 59 on the table. Ken made 59 to win 5-3. Ken revealed he nearly quit the game two years ago. 41-year-old Doherty admitted Williams's U-Turn in his career motivated himself. "Against Mark Williams it's going to be very difficult and there have been a lot of good matches between us. I have done an interview with Ken last month before PTC1. And now Ken is in the semi-finals with his Australian family support. I wish for Ken continue his marvellous run on Australian Open!